Every year, hundreds of thousands of prospective business students all over the world sit down to take the GMAT (Graduate Management Admissions Test), including over 30,000 in India. The only countries with more GMAT candidates than India are the U.S. and China. In 2017, Indian test takers averaged a score of 583 out of 800, higher than the global average by 19 points (564), and higher than the U.S. average by 30 (553). The average GMAT candidate in India was 26 years old when they took the exam. The GMAT is an necessary step in applying for many graduate-level business courses, such as a Masters of Business Administration (MBA). There are over 200 programs in India that accept the GMAT, although many Indian students apply for international programs as well. In this article, we’ll look at everything you need to know about the GMAT, including the contents of the exam, when & where to take it, how it’s scored, how important it is, and more. 2 GMAT Exam Schedule: Should You Book in Advance or Wait Until You’re Ready? 6 GMAT Scores: What Should You Be Shooting for? 6.1 The Top 15 Business Schools in the U.S.
6.2 Is 720 the Magic Number? 7 The GMAT or the GRE? Both the Verbal and Quantitative sections are multiple choice and adaptive. This means that the difficulty level of the questions will increase or decrease based on how the candidate answers the first question. Test-takers who get the early questions right will see increasingly harder questions, while candidates who get them wrong will see easier ones but likely see a much lower GMAT score ultimately. This doesn’t mean that a test taker can tell how well they’re doing as they go along. In order to properly assess a candidate’s ability, the computer has to offer some very easy questions, as well as questions that are beyond their skill level. The number of questions a test taker gets correct is less important than the difficulty level of those questions. The Quantitative Section tests a candidate’s mathematical ability, including geometry, algebra, and data analysis. The quant section contains two problem types – Problem Solving and Data Sufficiency. Test takers aren’t allowed to use calculators, but are provided a marker and erasable noteboard at the test center. For most students, the trickier problem type is data sufficiency, which requires a candidate to decide whether or not there is sufficient data to answer a question correctly. The Verbal Section measures grammar, reasoning, and reading comprehension. The verbal section contains three question types – Sentence Correction, Critical Reasoning, and Reading Comprehension. While Sentence Correction questions may be tricky to answer if your grammar fundamentals are not sound, Critical Reasoning and Reading Comprehension require test takers to assimilate passages of varying lengths in order to answer questions that directly relate to the passage. The AWA, or Analytical Writing Assessment, requires the test taker to write an analysis and critique of a particular argument. 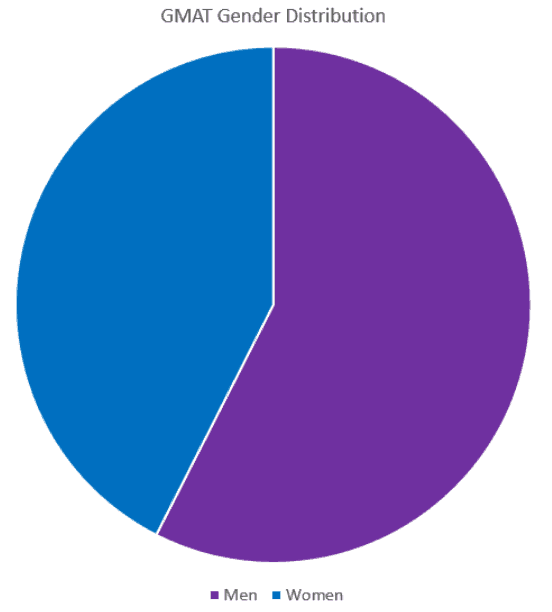 They have 30 minutes to write their response, which is then given two separate ratings: one by a human and one by a computer. The computer takes into account over 50 linguistic elements to determine a score, while a human reviewer reads and evaluates the response independently. If there is a multi-point discrepancy between the two scores, a second human reader will be brought in to review it. The Integrated Reasoning (IR) section was added in 2012. The section is intended to assess a candidate’s aptitude in a global business environment. The questions in this section involve analyzing charts, graphs, and tables, and measure how well a test taker can synthesize information from multiple sources. Test takers are expected to understand and interpret Venn diagrams, “Big Data” sets, and business scenarios that they might encounter in the real world – such as evaluating agricultural exports from Brazil. There are four types of questions in the IR section: Multi-Source Reasoning; Table Analysis; Two-Part Analysis; and Graphic Interpretation. Unlike in the Quantitative section, the IR section contains a built-in calculator that you can access on the screen. GMAT Exam Schedule: Should You Book in Advance or Wait Until You’re Ready? The GMAT is administered on-demand, which means that you can take it nearly any day of the year. Most test centers recommend registering several months in advance, since the available time slots can fill up when deadlines are approaching. There are test centers in 26 cities in India, and you can search for the one nearest you on the GMAT website. You can register at www.mba.com up to 6 months before your exam, or as little as 24 hours before if there are times available. If you reschedule more than 7 days in advance, there’s a $60 fee; if it’s within 7 days of the exam, you’ll have to pay the entire fee again. The test costs $250 (USD) no matter where in the world you take it. That’s around ~₹17,000, depending on the current exchange rate. Registering online is free, but there’s a $10 fee to register by phone. If you cancel your exam, you’ll get an $80 refund. If you can’t afford the fee, you might qualify for the GMAT Fee Waiver Program, although you’ll have to contact the program you’re applying for directly to request it. So when should you book it? Your best option is generally to schedule the exam early enough that you’ll be able to meet application deadlines, but leave yourself plenty of time to study and prepare for the test. Top-performing students spend over 120 hours preparing for the exam. Most exam centers are open year-round, while some may be available only for specific testing dates. Professional test centers such as Pearson VUE administer other exams as well, so you may be seated in a room with a dozen or more candidates taking other tests. When you arrive for the exam, the only items you’re allowed to bring into the testing room with you are eyeglasses and a light sweater or jacket. All other items, including phones and watches, must be left at home or placed in a locker. There are severe penalties for accessing notes and electronic devices during the exam, or for writing down questions from the exam to look up the answers later. In 2008, leaked questions from the GMAT were offered for sale online, and over 80 candidates were accused of cheating and had their scores canceled. Another scandal occurred in 2004, when Lu Xu was arrested for impersonating test candidates and taking the exam for them. He claims to have taken the test over 500 times, using false IDs and even wigs to fake his way into the testing room. Since then, the GMAT board has instituted tighter identification policies. Most test centers use passport readers and biometric devices, such as a palm vein scanner, to confirm a candidate’s identity before they can take the test. In addition, make sure that the name you register for the exam with — including your middle name or initial — exactly matches the ID that you’ll be bringing to the test center. Otherwise, there may be delays when signing in for your exam or receiving your scores. Be sure to arrive at the test center on time. Although the test only starts when you are seated at the computer — not the precise time that you are scheduled for — if you are more than 15 or 30 minutes late, your seat may be given away to another candidate. Consider taking a trip to the location in advance, especially if you haven’t been there before, so that you don’t get stuck in traffic or lost in an office building on the day of your test. While you aren’t allowed to bring in your own pencils or notebooks, the test center will provide an erasable notepad and marker. Accommodations, such as a private room, may be available for candidates with disabilities if requested in advance. Test takers have two optional 8-minute breaks; if you take longer than 8 minutes, you’ll lose time on the next section of the test. On breaks, you may access food and drink, but are not allowed to access study materials or remove any notes from the testing room. Some test prep programs, such as Kaplan, allow you to take a practice exam at an actual test center, to see what it’s like to take the test in a high-pressure environment. This is a good idea if you’ve never taken a computerized exam before and want to see how cold, loud, or bright the testing room will be. The “Official Test Day Experience” costs US $150 and can be booked online. You can also take practice exams from home directly on the MBA website. Take control of your GMAT experience with the GMAT Handbook. How much time and money should you spend preparing for the GMAT? Some students study for months before ever sitting down to take the exam. Others take it over and over again until they achieve a score they’re happy with. It doesn’t have to cost you a lot of money to do well, but if you’re determined to get into a good business school, it may be worth investing in a test prep program. Depending on your learning style, you can either self-study, attend in-person classes, or enroll in a course online. To start with, you can access the Official Starter Kit and Practice Exams 1 & 2 for free on the MBA website. This way, you can get a sense of what the test is like and see which sections you’re already strong in and which ones could use improvement. Use this score as a baseline to keep track of your progress and see how much further you have to go to reach your goal. Remember, it isn’t just about how well you know the material. Even if you’ve studied similar content in the past, you’ll need to adapt to the test structure and learn to pace yourself properly so you don’t have to rush through any questions. Most test prep programs recommend spending at least 8 weeks studying before the test. If you try and cram your prep into anything less than a month, you’ll risk burning yourself out. According to PrepScholar, you can expect to improve your score by around 50 points for every 50 hours that you study. No matter how long you spend studying, make sure to schedule a full day of rest before the exam so you aren’t too exhausted when you take the test. If you only have 30 days to study, start by purchasing the Official Guide and additional Practice Exams on the MBA website. Then, take a look at How to Prepare for the GMAT in 1 Month on ExamPal or purchase Brandon Wu’s 30-Day GMAT Success. But you should only consider a 30-day study plan if your practice test score is already high, or you have a tight application deadline coming up. Otherwise, be wise and plan for 60 or 90 days. A 60-day plan is considered the minimum for GMAT prep. The official website offers an 8-week guide that you can use to come up with a study plan. You can also try ExamPal’s How to Prepare for the GMAT in 60 Days or Beat the GMAT’s free 60-Day GMAT Study Guide. If you sign up for Beat the GMAT’s guide, you’ll get an email every day with study activities, tips, videos, and more. If you have the time, consider using a 90-day study schedule. PrepScholar offers two 90-day study templates: one for 100 hours of study (8 hours per week), and one for 200 hours (16-17 hours per week). Kaplan also has a 90-day guide you can work from to design your own study plan. Come up with a plan that is ambitious but realistic. If you’re working a full-time job, don’t expect to study as many hours per week as a student on summer holiday. Chances are, you’ll be stronger in one section of the GMAT than others. Many tutors suggest maintaining an error log so you know which type of problems you struggle with most. If you’re struggling with the Verbal or Quantitative section, choose books to help address those areas. Start with the GMAT Official Guide bundle, which includes both a Verbal and Quantitative review. If you’re looking to improve your Quantitative skills, VeritasPrep has dozens of free videos on YouTube, including videos that walk you through the solutions to specific test questions. To improve your Verbal skills, make a habit of reading more each day, especially business news that is similar to the kind of content that will be featured on the test. Magoosh has a suggested reading list of magazines, such as the Financial Times and the Economist, that deal with the same kind of material as the GMAT. Choose academic journals in the physical and social sciences to improve your reading comprehension and vocabulary. If you’re looking for more general practice, Magoosh also offers free test prep apps you can use on your phone, including flash cards for both Quantitative and Verbal skills. Official Guide Verbal Review: The official verbal review guide contains 300 actual test questions from previous tests. However, it doesn’t offer any strategy. Use this to supplement your practice test questions, but don’t treat it as an advanced guide to the Verbal section. Manhattan Prep Sentence Correction Guide: This guide is focused on sentence correction, one of the question types on the Verbal exam. It covers the topic thoroughly, and includes a question bank online, but is reportedly a difficult read for non-native speakers. Aristotle GMAT Sentence Correction Grail: This book is clearly-written and easier to read than the Manhattan Prep Guide. It includes an “idiom list” and an emphasis on comprehending the “meaning” of a phrase. However, only some content is formatted in the GMAT style. Manhattan Prep Reading Comprehension Guide: This guide includes passages in the GMAT style as well as an online question bank. It offers seven reading comprehension strategies, but doesn’t address how passage types differ (such as fiction vs. non-fiction). Official Guide Quantitative Review: The official review includes 300 quantitative questions from previous GMAT tests. Questions are structured by difficulty, but most are easy to moderate. It’s good for getting familiar with the question format, but not for advanced strategy. Manhattan Prep Strategy Guides: The Manhattan Guides are highly recommended, and focus mostly on strategy, although there are practice questions online. Since these books are each on a different Quantitative topic, you can choose from any of the topics you want to work on. Veritas Prep Guides: These guides (12 in all) are also topic-based, so you can purchase the entire set or just buy the ones you want to work on. These books have more practice questions than the Manhattan Guides, and the full set includes a “test simulation” booklet. Kaplan GMAT Math Workbook: This book is designed to help you work through the material in a way that covers all of the concepts on the test. However, it’s not presented in the GMAT format, so is less useful for getting familiar with the types of questions that are on the exam. If you need additional help beyond self-study guides, there are dozens of test prep companies that can help you study and prepare for the test. While courses can be expensive, you get the added benefit of structured lessons as well as the chance to see how other students engage with the material on the test. Kaplan offers a range of classes, including an “Official Test Day Experience” for both the GMAT and the GRE. They offer a Higher Score Guarantee, and will refund your money if your score doesn’t improve after taking one of their courses. They also have an Adaptive Question Bank that chooses questions based on your ability — just like the actual exam. Manhattan Prep and Veritas Prep both offer live classes and 1-on-1 tutoring either in person or online. The more interactive the lessons, the more you can expect to pay. If brand-name courses are out of your price range, you can look for local classes in your vicinity, or hire a private tutor at an hourly rate. Each part of the GMAT is scored separately, while also contributing to the Total Score. Total scores range from 200-800 in increments of 10. The Advanced Writing Assessment (AWA) receives a score of 1-6 and the Integrated Reasoning (IR) section is graded from 1-8. This means that it’s generally better to guess on questions you don’t know the answer to, rather than skip them. Leaving questions unanswered can dramatically impact your score. In the IR section, you may be required to get all parts of a question right for it to count as correct. Before the exam starts, you’ll be asked to choose up to five programs where you’d like your Official Score Report to be sent. You can have additional copies of the score report sent to any number of programs for an added fee, for up to five years after you’ve taken the exam. Once the exam is completed, you’ll receive an unofficial score report on the computer screen. If you are happy with the results, you can accept the report and have it sent to the programs you selected earlier. You’ll also receive a printout of the report when you leave the test center. If you are unhappy with the results and want to try again, you have two minutes to cancel the scores. If you choose this option, you won’t receive a printout and the programs you selected will not receive a copy of your score. This is a good option if you’ve under-performed or were simply using this test as a practice session. You’ll receive your Official Score Report around three weeks after you take the exam. This report will include your Total Score, as well as scores for each of the individual sections and a percentile ranking showing how you compared to other test takers. It will include the score for the Analytical Writing Assessment, which was not included on the unofficial report. Now, you can decide whether your score is sufficient for the program you’re applying for or if you’d like to retake the exam. If you plan to re-test, keep in mind that there’s a 16-day waiting period before you can sit for the exam again. You can take the exam up to five times in a single year, and only eight times in all. If you’ve gotten a “perfect score” of 800, then you won’t be eligible to test again for five years. If there are any issues with your test session, such as a technical problem or suspected rule infraction, your scores may be canceled or withheld. Your Official Score Report may be marked with a T (Testing Issue), P (Policy Violation), or S (Serious Policy Violation), and this information will remain on your report for 5 years. Candidates can appeal this decision within 30 days. You can also request to have your AWA essay rescored within 6 months for an added fee. If you want more information on your score, you can order an Enhanced Score Report from the MBA store. This will break down your strengths and weaknesses in each section into greater detail so you know how better to prepare for the next time you take the exam. GMAT Scores: What Should You Be Shooting for? What is a “good” GMAT score? That depends on the program you’re applying for. As of 2016, the worldwide average score was 547; only 11% of test takers scored higher than 700. But remember, if 728 is the average score for a given school, not all incoming students reached that mark; around half of successful applicants scored lower. At Stanford University’s Graduate School of Business, for example, the average score for two years in a row was 737 – the highest of any university. However, in the Class of 2018, the scores ranged from 590 to 790. The important thing is to score high enough to show that you’re a qualified candidate, and have supporting credentials to make your candidacy stand out as a whole. The Top 15 Business Schools in the U.S.
How do GMAT scores break down by school? As of 2016, the top 10 schools in the United States had an average GMAT score of at least 715 and the top 15 had scores above 700. The rest had scores below 700, with University of Pittsburgh rounding out the top 50 with 647. For several years, the top school has been the Stanford Graduate School of Business, followed closely by the Wharton School of Business at the University of Pennsylvania. The rest of the top 50 is pretty evenly split between well-known universities and less familiar ones like the Penn State Smeal College of Business. If your school isn’t on the list, you can look up its most recent GMAT average by searching for its “class profile” on Google. For example, Stanford’s profile for the MBA class of 2020 shows that 44 percent of entrants are international students, from 63 different countries. Students had an average of 4 years of work experience and 14% had an advanced degree. GMAT scores ranged from 600-790, with an average score of 732; average GRE scores were 165 in both Verbal and Quantitative. Is 720 the Magic Number? So, what score should you aim for if you want to get into one of the top 15 schools in the U.S.? Many GMAT advisors recommend a 720, which puts you in the 95th percentile of test takers. This is considered a “safe” score if you want to get into an Ivy League institution. “Safe” doesn’t mean you’ll definitely get in, and adding another 10 or 20 points to your score can’t hurt, particularly for Indian applicants. But it means that you’ll be taken seriously as a candidate, and can consider putting more time into your supporting documents than studying to retake the test. If you haven’t reached 700, then consider re-taking the test until you do; or, set your sights on a slightly lower-ranking school. For schools ranked 11-15, the average score is 695. So, a score between 700 and 720 will put you well within the “safe” zone for the top 15 schools, and still leave you in the running for the top 10. Aside from scores, what else can we learn from GMAT statistics? What age group is most likely to take the exam? Is it more popular in some countries than in others? Here’s how candidates for the GMAT break down across age, gender, and location. In 2013, 57.5% of test takers were men; 42.5% were women. Among men, the average score was 555 and among women it was 534. Overall, average GMAT scores have been trending upward: they rose from 548 in 2012 to 558 in 2016. In 2017, most GMAT tests were taken in the U.S. (103,855 ) and Southeast Asia (67,795). Central and South Asia, including India, had 29,151 candidates, while Western Europe had 21,033 . 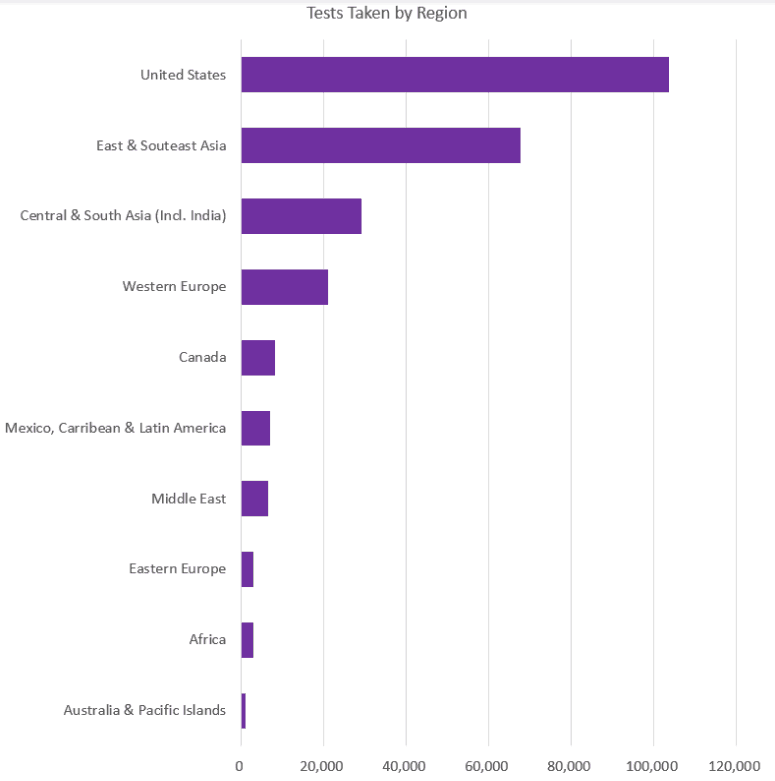 Here’s the number of tests distributed across all global regions, according to GMAC. 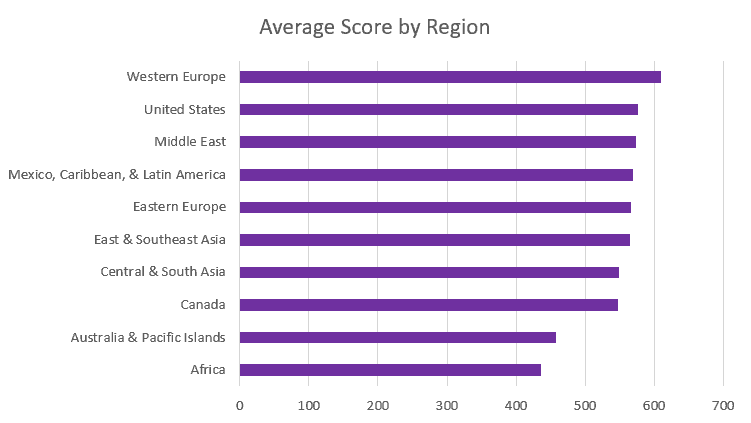 The average global score was 558, with the highest-scoring region being Australia and the Pacific Islands at 610, although only 1,018 candidates came from that region. Nearly 70 percent of total scores, and 44.9 of scores by non-U.S. citizens, were sent to schools in the U.S., showing that it is still a top destination for international students. The average age of test takers was 25.6 years old in 2017; only 13% of candidates were over the age of 31. Nearly 40 percent of candidates send their scores to a full-time MBA program. The GMAT or the GRE? Over 5,000 courses at 2,000 universities rely on GMAT scores to help them choose candidates for their program. However, it isn’t the only test available for business school admissions. The Graduate Record Examinations, or GRE, is accepted at many top business schools, including Stanford and Harvard. The GRE is cheaper than the GMAT, costing $205 worldwide. Many candidates report that the GRE’s math section is much easier than the GMAT, but that its verbal section is harder. If the school you want to apply for accepts both exams, you may want to choose the exam that plays to your strengths. Consider taking an online practice version of both the GRE and the GMAT and see which one you do better at. If you’re applying to other graduate programs besides an MBA, you’ll definitely want to take the GRE. The GMAT is only accepted by business schools, while the GRE is required for most graduate programs. Like the GMAT, the GRE is available as a computer-based adaptive test.. The GRE contains three types of questions: Verbal, Quantitative, and Analytical Writing. The highest possible score is 170 on the Verbal and Quantitative sections, and the lowest is 130. The Analytical Writing section is scored from 0-6, just like the GMAT. The GRE also offers additional Subject Tests, in Mathematics, Chemistry, Physics, Biology, Literature, and Psychology, but these tests are not usually required by graduate programs. Remember, your GMAT score is important, but it isn’t the only thing that matters. Some critics argue that standardized test scores aren’t an accurate measure of a student’s ability, and that other factors should carry more weight in deciding whether to admit an applicant. Some top MBA programs, like Canada’s Rotman School of Business at the University of Toronto, offer a GMAT waiver and allow candidates to apply using the CFA degree. If you can’t seem to improve your score no matter how hard you try, don’t get discouraged. It doesn’t mean you won’t be able to get into business school. You can put more effort into other parts of your application, such as your interview, essay, and personal references. Your GMAT score is just one piece in presenting a well-rounded picture of who you are.